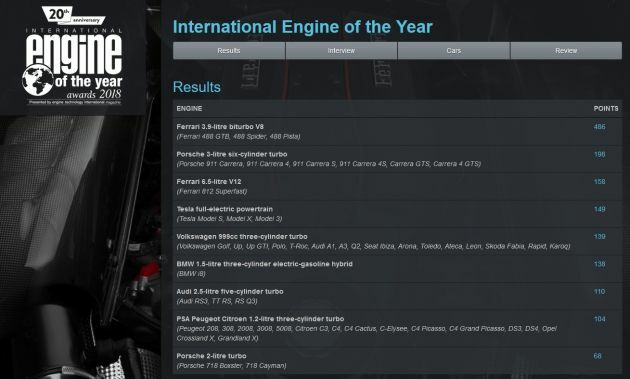 Ferrari has emulated Ford’s feat in becoming a triple crown winner with its F154CB, which bagged the International Engine of the Year award for the third time. The 3.9 litre twin-turbo V8 won the award in 2016 and last year. The mill, which features on the 488 GTB, 488 Spider and 488 Pista, was a convincing winner again this year, amassing 486 points to finish ahead of Porsche’s 3.0 litre turbo six-cylinder (198 points) on the 911 and its stablemate 6.5 litre V12 (158 points), seen on the 812 Superfast. The F154CB also took home the Performance Engine and Best 3-Litre to 4-Litre engine awards for 2018 to make it a trio of awards. 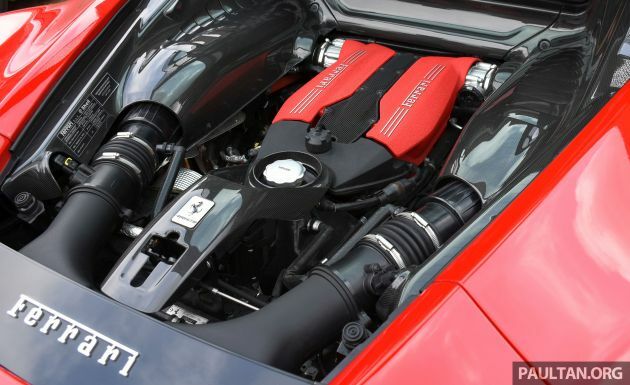 The Superfast’s F140 GA made it five for the boys from Maranello by taking the Best New Engine title – ahead of BMW’s 4.4 litre twin-turbo V8 from its M car applications – and the Above 4-Litre award. As before, 13 categories were contested, and the remaining nine saw a number of winners from other manufacturers. For the capacity-specific ones, Volkswagen emerged with the Sub 1-Litre award with its 1.0 litre three-cylinder turbo, which is found on a number of VW Group offerings. In the 1-Litre to 1.4-Litre category, PSA Peugeot Citroen’s 1.2 litre three-pot won this year’s title, finishing ahead of three competitors from Volkswagen, while the 1.4-Litre to 1.8-Litre category saw the 2015 IEotY winner, the BMW 1.5 litre three-cylinder turbocharged hybrid engine in the BMW i8, emerging as champion. Porsche took the 1.8-Litre to 2-Litre title with its 2.0 litre turbo from the 718 Boxster and Cayman, while the Audi 2.5 litre five-pot from the RS3, RS Q3 and TT RS emerged as the winner in the 2-Litre to 2.5-Litre category. The 3.0 litre turbo six on the 911 did bag a medal by taking the 2.5-Litre to 3-Litre title this year. The final two categories were for best Electric Powertrain and Green Engine, and here, Tesla scooped up both with its full-electric powertrain, finishing ahead of BMW’s full-electric system from the i3 and 1.5 litre three-cylinder turbo hybrid from the i8 respectively. SO where is myvi and vios engine that is touted as best engine by p2/toyota supporters? And where is campro engine and punch cvt that are touted as best engine and best transmission by p1 supporters? Don’t start flame war ok? Toyota engine is in the list, where is Proton engine? Those u shown are Merc engine, not Proton engine. john, u can manipulate the likes/dislikes but u still can’t change the fact that Proton engine is not in the list. And no, Merc engine is not Proton engine. The truth prevails. Aik. How do pipu manipulate the like/dislike system? U certainly know how isnt it. Kantoied! And Mesidis=Geely=P1. So apa sarahan Geely? Say whatever u like lah, u know what u did. There are other people that will correct u. No, pipu buys P1 becoz its safe.